Tone-Blending Microphone Preamp & DI Box. Universal Audio 710 Twin-Finity - New Factory Repack. Universal Audio 710 Twin-Finity Tone-Blending Mic Preamplifier & DI Box (New Factory Repack). This 710 Twin-Finity Tone-Blending Mic Preamplifier & DI Box. Is a new factory repack item. It is in perfect condition. Comes with factory box and manual. 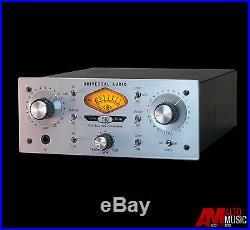 100% Tube to 100% Solid State - a Variable Tone Blending Mic Preamp & DI. The award-winning 710 Twin-FinityT is a radically new UA mic preamp design that combines both the classic retro warmth of tubes with the transient bite of solid-state, all in a 2U, half-rack unit. The 710 was created specifically to add the tonal versatility and sonic inspiration missing from generic audio interface preamps. Tone blending is continually variable between 100% tube and 100% solid-state, offering a practically infinite range of unique preamp tones, plus the ability to easily dial-in your own signature sound. There are lots of sensibly priced solid-state and tube preamplifiers out there, but the 710 is the only one that offers the best of both worlds - as well as everything in-between - all in one box, and within reach of any serious project studio's budget. The key to its sonic flexibility lies in its innovative circuit design, featuring a solid-state transimpedance input amp simultaneously driving separate, phase-aligned tube and solid-state gain stages, which are then summed to a single output.. The mix between the 310 volt single-ended class-A triode tube stage and solid-state transimpedance stage is controlled via the "Blend Knob" labeled "? Blending is continually variable between 100% tube and 100% solid-state offering a practically infinite range of unique pre-amp tones and the ability to easily dial-in your own signature sound. Like all our other preamp designs, the 710 features dual gain-stage controls (Gain/Level) which can radically vary the amount of coloration and distortion by allowing you to crank up the input gain like a guitar amp. The VU meter features a unique "Drive" mode allowing you to see how hard you are driving the input stage. Versatility makes the 710 the perfect preamp partner for any mic collection. Plus, the discrete JFET DI input circuit can also easily handle any electric instrument. Guitar and bass players will especially appreciate the 710s ability to bring out the best of both active and passive pickups. The 710 Twin-Finity includes a 19 rack-kit for mounting one or two units. Classic Putnam 610 console mic preamplifier and DI. Legendary all-tube sound, at a project studio price. Gain, Level, and Impedance selection for maximum tonal variety. Twin-FinityT Tone-Blending Mic/Line Preamp & Hi-Z Instrument DI. Dual-Path 310 volt Class-A Tube and Transimpedance Solid State Preamp. Phase-Aligned "Tone-Blending" of Tube and Solid State. Dual Gain Stages: Wire with Gain to Creamy to Crunchy. Discrete JFET DI with 2.2M ohm Ultra Hi-Z impedance. 70dB+ of gain, +48V Phantom, Pad(-15dB), Phase Invert, and Low Cut Filter(75Hz). Output and "Drive" backlit VU metering. Portable, Rack-Mountable design for Studio, Desktop or Stage. 19 Rack Kit Included, Optional Desktop Handle Kit also available. Front Panel Hi-Z Input (switched from Mic/Line automatically via Jack Detect). Rear Panel XLR Mic Input, XLR Line Input and XLR Line Output. Unbalanced Instrument (1/4 jack) D. Tube & Solid-State Phase-Aligned Tone-Blending Mic Pre & DI. 8.45W x 3.5H x 10.25D. 7 dBu dBu +8 dBu w/pad. Maximum Hi-Z Input Level Gain Min SS. Maximum Hi-Z Input Level Gain Min Tube 1% THD. Maximum Output Level into 600 ohms. Maximum Output Level into 100k ohms. 20Hz to 100kHz +/- 0.2 dBu. 0.1% tube 0.005% solid-state. These charges are the buyers responsibility. The item "Universal Audio 710 Twin-Finity New Factory Repack" is in sale since Tuesday, January 05, 2016. This item is in the category "Musical Instruments & Gear\Pro Audio Equipment\Preamps & Channel Strips". The seller is "altomusicpro" and is located in Middletown, New York.